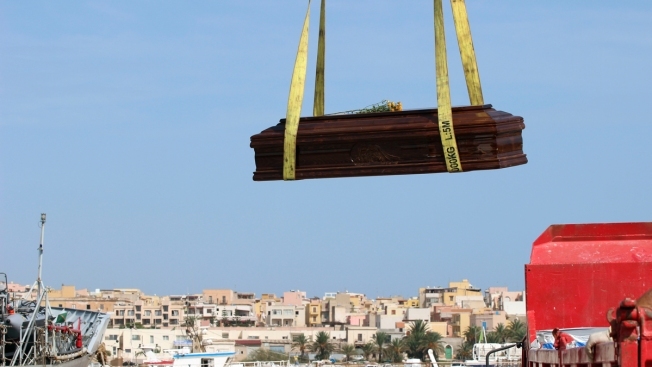 In this Saturday, Oct. 12, 2013 file photo, the casket of one of the migrants who died when their boat capsized off in the Canal of Sicily is lifted by crane to an Italian Navy ship at the Lampedusa island harbor. A fishing boat packed with 500 African migrants capsized on Thursday Oct. 3, 2013 off the shores of the island of Lampedusa, causing more than 300 deaths. One by one, five to a grave, the coffins are buried in the red earth of this ill-kept corner of a South African cemetery. The scrawl on the cheap wood attests to their anonymity: "Unknown B/Male." Far less visible, however, has been the toll of this mass migration : The tens of thousands of people who die or simply disappear during their journeys, never to be seen again. A growing number of migrants have drowned, died in deserts or fallen prey to traffickers, leaving their families to wonder what on earth happened to them. At the same time, anonymous bodies are filling cemeteries around the world, like the one in Gauteng. An Associated Press tally has documented at least 56,800 migrants dead or missing worldwide since 2014 — almost double the number found in the world's only official attempt to try to count them, by the U.N.'s International Organization for Migration . The IOM toll as of Oct. 1 was more than 28,500. The AP came up with almost 28,300 additional dead or missing migrants by compiling information from other international groups, requesting forensic records, missing persons reports and death records, and sifting through data from thousands of interviews with migrants. The AP's tally is still low. Bodies of migrants lie undiscovered in desert sands or at the bottom of the sea. And families don't always report loved ones as missing because they migrated illegally, or because they left home without saying exactly where they were headed. For example, when more than 800 people died in an April 2015 shipwreck off the coast of Italy, Europe's deadliest migrant sea disaster, Italian investigators pledged to identify them and find their families. More than three years later, under a new populist government, funding for this work is being cut off. "No matter where you stand on the whole migration management debate....these are still human beings on the move," said Bram Frouws, the head of the Mixed Migration Centre , based in Geneva, which has done surveys of more than 20,000 migrants in its 4Mi project since 2014. "Whether it's refugees or people moving for jobs, they are human beings." They leave behind families caught between hope and mourning, like that of Safi al-Bahri. Her son, Majdi Barhoumi, left their hometown of Ras Jebel, Tunisia, on May 7, 2011, headed for Europe in a small boat with a dozen other migrants. The boat sank and Barhoumi hasn't been heard from since. In a sign of faith that he is still alive, his parents built an animal pen with a brood of hens, a few cows and a dog to stand watch until he returns. "I just wait for him. I always imagine him behind me, at home, in the market, everywhere," said al-Bahari. "When I hear a voice at night, I think he's come back. When I hear the sound of a motorcycle, I think my son is back." Of the world's migration crises, Europe's has been the most cruelly visible. Images of the lifeless body of a Kurdish toddler on a beach, frozen tent camps in Eastern Europe, and a nearly numbing succession of deadly shipwrecks have been transmitted around the world, adding to the furor over migration. Two shipwrecks and the deaths of at least 368 people off the coast of Italy in October 2013 prompted the IOM's research into migrant deaths. The organization has focused on deaths in the Mediterranean, although its researchers plead for more data from elsewhere in the world. This year alone, the IOM has found more than 1,700 deaths in the waters that divide Africa and Europe. Khalid Arfaoui had planned to be among them. When the group knocked at his door, it wasn't fear that held him back, but a lack of cash. Everyone needed to chip in to pay for the boat, gas and supplies, and he was short about $100. So he sat inside and watched as they left for the beachside campsite where even today locals spend the night before embarking to Europe. "If I had gone with them, I'd be lost like the others," Arfaoui said recently, standing on the rocky shoreline with a group of friends, all of whom vaguely planned to leave for Europe. "If I get the chance, I'll do it. Even if I fear the sea and I know I might die, I'll do it." "It didn't feel right," Aguida said. There has been no word from the other six — yet another group of Ras Jebel's youth lost to the sea. With no shipwreck reported, no survivors to rescue and no bodies to identify, the six young men are not counted in any toll. In addition to watching its own youth flee, Tunisia and to a lesser degree neighboring Algeria are transit points for other Africans north bound for Europe. Tunisia has its own cemetery for unidentified migrants, as do Greece, Italy and Turkey. The one at Tunisia's southern coast is tended by an unemployed sailor named Chamseddin Marzouk. Of around 400 bodies interred in the coastal graveyard since it opened in 2005, only one has ever been identified. As for the others who lie beneath piles of dirt, Marzouk couldn't imagine how their families would ever learn their fate. "Their families may think that the person is still alive, or that he'll return one day to visit," Marzouk said. "They don't know that those they await are buried here, in Zarzis, Tunisia." Despite talk of the 'waves' of African migrants trying to cross the Mediterranean, as many migrate within Africa — 16 million — as leave for Europe. In all, since 2014, at least 18,400 African migrants have died traveling within Africa, according to the figures compiled from AP and IOM records. That includes more than 4,300 unidentified bodies in a single South African province, and 8,700 whose traveling companions reported their disappearance en route out of the Horn of Africa in interviews with 4Mi. South Africa also has one of the world's highest rates of violent crime and police are more focused on solving domestic cases than identifying migrants. "There's logic to that, as sad as it is....You want to find the killer if you're a policeman, because the killer could kill more people," said Jeanine Vellema, the chief specialist of the province's eight mortuaries. Migrant identification, meanwhile, is largely an issue for foreign families — and poor ones at that. Vellema has tried to patch into the police missing persons system, to build a system of electronic mortuary records and to establish a protocol where a DNA sample is taken from every set of remains that arrive at the morgue. She sighs: "Resources." It's a word that comes up 10 times in a half-hour conversation. "Every person has a right to their dignity. And to their identity," said Stephen Fonseca, the ICRC regional forensic manager. THE UNITED STATES: "THAT'S HOW MY BROTHER USED TO SLEEP"
In 2010 the Argentine Forensic Anthropology Team and the local morgue in Pima County, Ariz., began to organize efforts to put names to the anonymous bodies found on both sides of the border. The "Border Project" has since identified more than 183 people — a fraction of the total. At least 3,861 migrants are dead and missing on the route from Mexico to the United States since 2014, according to the combined AP and IOM total. The tally includes missing person reports from the Colibri Center for Human Rights on the U.S. side as well as the Argentine group's data from the Mexican side. The painstaking work of identification can take years, hampered by a lack of resources, official records and coordination between countries — and even between states. They knew they were risking their lives — Reyes' father died migrating in 1995, and an uncle went missing in 2004. But Luna, a quiet family man, wanted to make enough money to buy a pickup truck and then return to his wife and two children. Reyes wanted a job where he wouldn't get his shoes dirty and could give his newborn daughter a better life. "That's how my brother used to sleep," she whispered. "We all cried," Luna recalled. "But I said, we cannot be sure until we have the DNA test. Let's wait." Orona holds out hope that the men may be locked up, or held by "bad people." Every time Luna hears about clandestine graves or unidentified bodies in the news, the anguish is sharp. "Suddenly all the memories come back," she said. "I do not want to think." 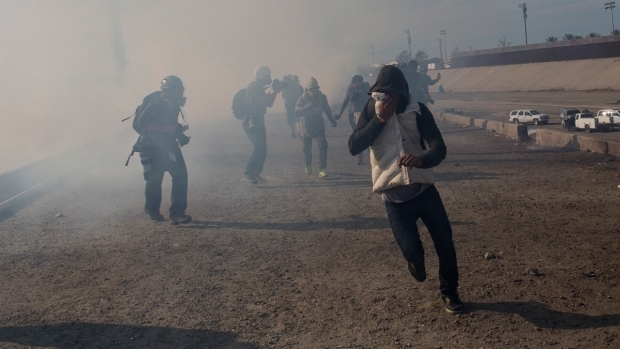 SOUTH AMERICA: "NO ONE WANTS TO ADMIT THIS IS A REALITY"
The toll of the dead and the missing has been all but ignored in one of the largest population movements in the world today — that of nearly 2 million Venezuelans fleeing from their country's collapse. These migrants have hopped buses across the borders, boarded flimsy boats in the Caribbean, and — when all else failed — walked for days along scorching highways and freezing mountain trails. Vulnerable to violence from drug cartels, hunger and illness that lingers even after reaching their destination, they have disappeared or died by the hundreds. "They can't withstand a trip that hard, because the journey is very long," said Carlos Valdes, director of neighboring Colombia's national forensic institute. "And many times, they only eat once a day. They don't eat. And they die." Valdes said authorities don't always recover the bodies of those who die, as some migrants who have entered the country illegally are afraid to seek help. "Everyone just seems to pass the ball," she said. "No one wants to admit this is a reality." Gutierrez's mother, Mariela Gamboa, said that a driver offered a ride to the two women, but refused to take her son. The women agreed to wait for him at the bus station in Cali, about 160 miles (257 kilometers) ahead, but he never arrived. Messages sent to his phone since that day four months ago have gone unread. "I'm very worried," his mother said. "I don't even know what to do." The region with the largest overall migration, Asia, also has the least information on the fate of those who disappear after leaving their homelands. Governments are unwilling or unable to account for citizens who leave for elsewhere in the region or in the Mideast, two of the most common destinations, although there's a growing push to do so. Asians make up 40 percent of the world's migrants, and more than half of them never leave the region. The Associated Press was able to document more than 8,200 migrants who disappeared or died after leaving home in Asia and the Mideast, including thousands in the Philippines and Indonesia. His brother Murtaza was exhausted by the time they reached the Iran-Turkey border. But the smuggler said it wasn't the time to rest — there were at least two border posts nearby and the risk that children far younger travelling with them would make noise. Almass was carrying a baby in his arms and holding his brother's hand when they heard the shout of Iranian guards. Bullets whistled past as he tumbled head over heels into a ravine and lost consciousness. When Almass eventually called home, from Turkey, he couldn't bear to tell his mother what had happened. He said Murtaza couldn't come to the phone but sent his love. That was in early 2014. Almass, who is now 18, hasn't spoken to his family since. Almass said he searched for his brother among the 2,773 children reported to the Red Cross as missing en route to Europe. He also looked for himself among the 2,097 adults reported missing by children. They weren't on the list. With one of the world's longest-running exoduses, Afghans face particular dangers in bordering countries that are neither safe nor welcoming. Over a period of 10 months from June 2017 to April 2018, 4Mi carried out a total of 962 interviews with Afghan migrants and refugees in their native languages around the world, systematically asking a series of questions about the specific dangers they had faced and what they had witnessed. Almass made it from Asia to Europe and speaks halting French now to the woman who has given him a home in a drafty 400-year-old farmhouse in France's Limousin region. But his family is lost to him. Their phone number in Afghanistan no longer works, their village is overrun with Taliban, and he has no idea how to find them — or the child whose hand slipped from his grasp four years ago. "I don't know now where they are," he said, his face anguished, as he sat on a sun-dappled bench. "They also don't know where I am."